To obtain the best results possible, a Toronto wedding photographer has to take into consideration many elements. First, the quality and direction of light, then the technique uses, what lens to use, what aperture, iso and shutter speed for the best results in a particular context. Finally and most important, what will create an element of interest in the photo? For this shot, the main element of interest is the high angle from which this picture was taken. During the recessional at this Berkeley Church wedding, I rushed upstairs and waited for the couple to reach a good position in the frame, and only then I took the shot. 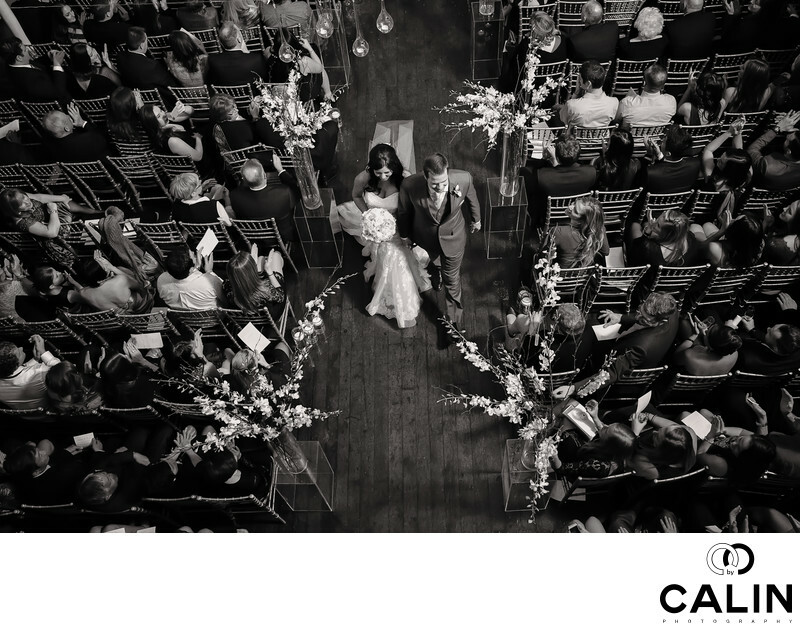 It is rare for a Toronto wedding photographer to be able to photograph from a very high vantage point. As such, when I scouted Berkeley Church before photographing this wedding, I noticed the mezzanine. The first thing that went through my mind was to take a birds-eye view of the whole church from the mezzanine. Then, during the wedding ceremony, I went a step further and, using a 70 to 200 mm telephoto lens I took quite a few frames from the mezzanine. What Makes this Berkeley Church Image Special? Many wedding photographer novices look at the picture and realise its beauty, but first, they can never explain why is great. Second, they don't know how it was made. Let's analyse it, shouldn't we? The first striking element of this image is the unusual vantage point I used when capturing it. The bride and groom were almost underneath me when I pressed the shutter button. Second, the composition is brilliant. This is a symmetrical photo which also suggests movement. The bride and groom are flanked by rows of chairs to their right and left, which gives the picture stability and symmetry. Also, they are walking on the aisle, and I positioned them slightly towards the top edge of the frame as opposed to the centre. That in effect, suggests movement and creates tension in this picture. I also expected one of the golden rules of photography which says that the picture should allow breathing space for the subject to move towards the edge of the frame. This image also employs a framing element. Four large vases containing white flowers perfectly frame the bride and groom. As this image includes a multitude of guests dressed in various colours, I choose a black and white processing. Let me explain my thought process. If the colours in the image do not add value to the photo, but the rather distract the viewer, I choose a black and white processing over a coloured one. In this case, the guests were wearing primary colours, red, blue and yellow, which draw the viewer's attention to them, in effect competing for attention with the bride and groom in this picture. By desaturating the image, it is clear that the newlyweds are the main subject of this picture. That is also supported by the composition and by the fact that everybody is looking at them, creating leading lines that emphasise the couple. All in all, this is a gorgeous image in the usual reaction of my potential clients, when they see this photo, is a resounding WOW!